One of the premier baseball card sets of the early millennium, 2002 Bowman Draft Picks & Prospects Baseball has as many hits as it does misses. Over the years, several players in the set have soared, only to crash a year or two later. Dontrelle Willis and Jeff Francoeur, anyone? 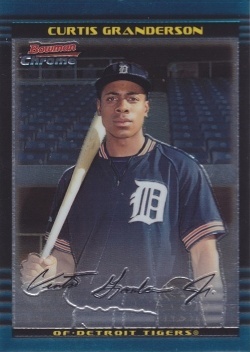 At the same time, other rookie cards, such as Joey Votto and Curtis Granderson, have emerged as legitimate hobby superstars. 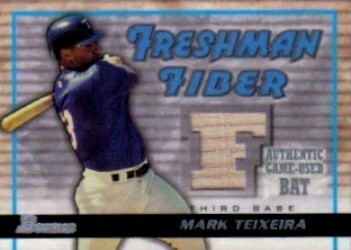 Following the format introduced in 2001 Topps Traded and Rookies, 2002 Bowman Draft Picks & Prospects combines both regular Bowman and Bowman Chrome. Each has their own identical 165-card base set, with ten autographs expanding the Chrome checklist to 175 cards. Seven-card packs come with just two Chrome cards. 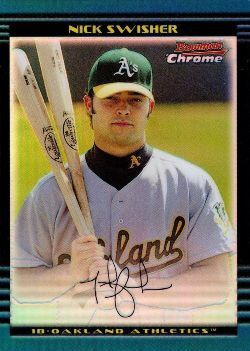 Not surprisingly, the rarer Bowman Chrome cards are, by far, the more desirable of the two. 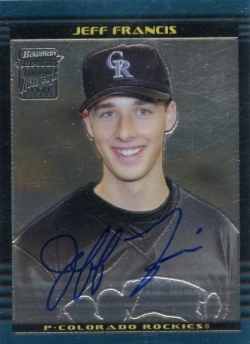 None of the base Chrome Autographs have panned out, although it does make building a set affordable. Autographs and memorabilia cards are both part of the insert chase. Beside the base Chrome Autographs, Signs of the Future autographs are also available. 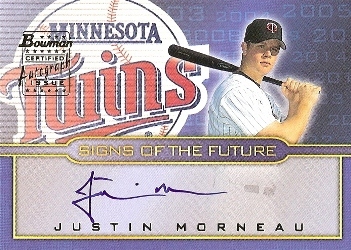 Justin Morneau is the biggest name on the checklist. Fabric of the Future memorabilia cards fall 1:55 packs. Freshman Fiber has both bat (1:605) and jersey (1:45) cards. But what would a Bowman Chrome set be without Refractors? 2002 Bowman Draft Picks & Prospects has three levels of them. Basic Refractors are numbered to 300 copies. Autographs are inserted 1:154 packs. X-Fractors are limited to 150 copies with autographs falling 1:309 packs. Finally, Gold Refractors are numbered to 50. 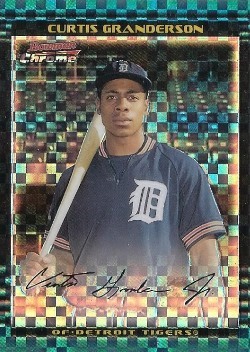 A basic Bowman Gold parallel is inserted one per pack. 2002 Bowman Draft Picks & Prospects hobby boxes have 24 packs. 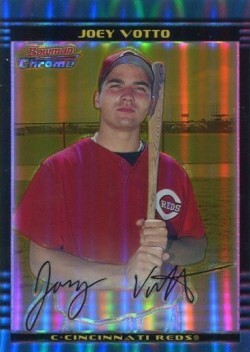 RC JOEY VOTTO 2008 Bowman Chrome Draft #BDP9 ROOKIE CARD !! !